Mitigation banking is a system of credits and debits developed by regulatory agencies to ensure that development impacts to wetlands and streams, or to rare species and habitats, is compensated for by preservation, enhancement, restoration or even creation of similar ecological features in nearby areas so that there is no net loss to local ecosystems. To ‘mitigate’ means to reduce the severity of something, to compensate for a loss, in this case the damage caused to the natural environment. A mitigation bank is a site developed for such a purpose. The person or entity undertaking such work is referred to as a mitigation banker. Just as a commercial bank has cash as an asset that can be loaned to customers, a mitigation bank has mitigation credits as its assets that can be sold to those who are trying to comply with certain environmental regulations and offset ecological impacts they are responsible for. When these credits are sold in an active marketplace they can be referred to as ‘ecological assets’. In this respect they can be compared to other extractable natural resources such as minerals, oil & natural gas. Generally the purchasers of mitigation credits are individuals or entities undertaking commercial or industrial projects who must comply with state and federal environmental regulations. Wetland or stream banks that offer credits to offset ecological impacts to wetlands and streams. These banks are regulated and approved by the USACE (Army Corps of Engineers) and the USEPA (Environmental Protection Agency). Because wetland banks were the first type of offset program to come into being these are often still referred to a ‘mitigation banks’. However, the term Mitigation Bank now includes both wetland and stream banks and conservation banks discussed below. Conservation banks that offer credits to offset losses of rare or special species and/or their habitats usually listed as threatened or endangered by state and federal laws. These banks are regulated and approved by USFWS (Fish and Wildlife Service) and NMFS (National Marine Fisheries Service). The mitigation banker may create a mitigation bank on an active farm or ranch, an unused commercial or industrial property, or they may purchase an environmentally damaged site that they wish to regenerate in ecological terms. The mitigation banker works with state and federal regulatory agencies who will approve plans for building, maintaining and monitoring the bank. These agencies also negotiate and approve the number of mitigation credits that the bank may earn and sell. These mitigation credits may then be bought by anyone who plans to undertake commercial development that will in the process negatively impact ecological features of that region. 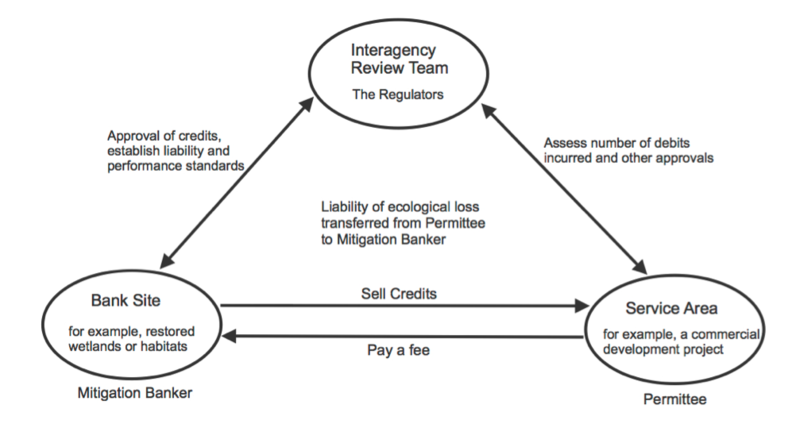 The mitigation banker is responsible for not just the development, but also the future upkeep and maintenance of the mitigation bank – usually in concert with a Land Trust that has been adopted as the ‘sponsor’ for the mitigation bank. The bank site: the physical acreage that is restored, established, enhanced, or preserved. The bank instrument: the formal agreement between the bank owners and regulators establishing liability, performance standards, management and monitoring requirements, and the terms of bank credit approval. The Interagency Review Team (IRT): the interagency team that provides regulatory review, approval, and oversight of the bank. The bank service area: the geographic area within which permitted impacts can be compensated for at a given bank. (1) Protection and conservation of environment: Mitigation banking aids in protecting water quality as well as nature’s biological diversity. The impact of industrialization and urbanization on natural habitats, streams and wetlands is inevitable. Mitigation banks provide an opportunity to offset these impacts. (2) More efficiency: A mitigation bank is an efficient way to compensate for development impacts because it ensures that a large consolidated piece of land is conserved to offset numerous small regional impacts. The economies of scale and ecological benefits of a mitigation bank make it more efficient not just in terms of cost, but also in terms of the environmental protections. (3) Improves regulatory compliance: It is easier for developers to buy credits from an approved bank than to get regulatory approvals that might otherwise take months to procure. (4) Reduces compliance cost: It is easier for developers to buy credits from an approved bank than to build and operate a mitigation bank of their own. Purchasing credits means there is little-to-no time lag between the environmental impact within a service area and nearby compensation for those impacts. (5) Transfer of liability: The system of mitigation banking effectively transfers the liability of ecological loss from the developer (also called permittee) to the mitigation banker and its Land Trust sponsor. Once the permittee buys the required credits as per regulations, it becomes the responsibility of the mitigation banker and sponsor to maintain and monitor the site on a long-term basis. Currently, there are over 1200 approved, operating mitigation banks in the U.S. About 750,000 credits have been approved for these banks, and their total credit value is estimated to be $100 billion nationwide. About 11,000 credits trade hands each year, representing about $1 billion in sales, depending on the health of the economy and the volume of commercial development that is underway. The foremost challenge to the success of mitigation banking is the difficulty encountered by regulatory agencies in assigning a number of credits to each bank. The credits approved by mitigation banks have to be correctly judged based the regional importance of preserving, enhancing, restoring or creating ecological features on mitigation properties, as well as the science and engineering employed to achieve these goals. Agencies use of a number of environmental assessment techniques but it is not an easy task to fully capture the success of any mitigation project. They are often conservative in rewarding mitigation credits to bankers for these reasons. It is also questionable whether the natural habitats and wetlands that took centuries to evolve can be artificially rejuvenated in just a few years’ time. In some cases, the quality of mitigation sites in terms of floral and faunal diversity has been found to be sub-standard, compared to their natural counterparts. Mitigation banking is a system by which the liability for ecological impacts is transferred from the developer to a mitigation bank through a system of credits and debits implemented according to carefully crafted regulatory guidelines. A mitigation banker preserves, enhances, restores or creates ecological features at a bank site and earns mitigation credits, which are then sold to a developer for a fee. This system, despite some of its limitations, has many advantages. With increasing private investment in the development of mitigation banks and research on ecosystems as well as easing regulatory controls, the future for mitigation banking appears to be bright both for investors and for landowners.